University of Notre Dame alumna Kelley Tuthill will be the keynote speaker at the annual Pink Zone Luncheon on Feb. 9 (Sunday) at the Purcell Pavilion at Notre Dame. The luncheon, organized by the College of Science and the Notre Dame women’s basketball team, will bring together local oncologists, researchers, survivors and patients and their families. The luncheon will be held before the Notre Dame Women’s Basketball Pink Zone game against Syracuse at 3 p.m.
Tuthill is an award-winning reporter at WCVB-TV in Boston. 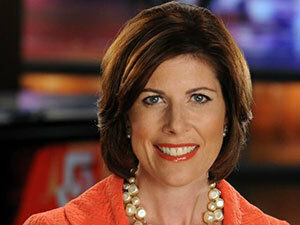 Her reporting of the protests outside the 2004 Democratic National Convention in Boston helped WCVB win the Best Breaking News Coverage Award from the Associated Press. In 2010, Tuthill received a Gracie Award for Outstanding Hard News Feature for her report that led to the government granting a woman’s dying wish to have her parents be allowed to travel from China for a visit. A breast cancer survivor, Tuthill poignantly shared her journey with WCVB viewers and online users. The cameras followed her from diagnosis, surgery, chemotherapy and radiation to life after cancer. She is also the co-author of “You Can Do This! Surviving Breast Cancer Without Losing Your Sanity or Your Style.” Tuthill’s work both on- and off-camera that explores all aspects of cancer has resulted in multiple national Gracie Awards and a regional Emmy. In 2008, she was recognized as a “Hero Among Us” by the Boston Celtics and earned a spot in a “40 under 40” list by the Boston Business Journal. She is also featured in the 2011 book “Boston: Inspirational Women” for her work on behalf of local and national breast cancer organizations. Tuthill earned a Bachelor of Arts degree in American studies from Notre Dame in 1992 and received a Master of Science degree from Columbia University Graduate School of Journalism. She is also a member of the College of Arts and Letters Advisory Council. “We are thrilled that Kelley will be joining us as the keynote speaker at this year’s Pink Zone luncheon,” said women’s basketball coach Muffet McGraw. Not only is Kelley a proud alumna of Notre Dame, but she courageously and successfully won her battle with breast cancer. It's that experience, and those that she has shared with those in her community as a successful journalist, that makes her such an engaging and insightful speaker for one of the cornerstone events of Pink Zone 2014. I would encourage all of our fans and friends in the Michiana community to join us Feb. 9 at the Pink Zone Luncheon as well as for our Notre Dame women's basketball game later that day against ACC rival Syracuse. Hope to see you there — Go Irish!" In addition to the luncheon, the College of Science has organized two 24-hour Spin-a-Thons in collaboration with RecSports (Feb. 7) and Knollwood Country Club (Feb. 8) to raise money for Pink Zone. Pink Zone proceeds benefit the WBCA Pink Zone initiative, a global, unified effort of the Women’s Basketball Coaches Association (WBCA) to assist in raising awareness and support for women with breast cancer. All of the funds raised this year will be distributed locally to Saint Joseph Regional Medical Center and RiverBend Cancer Services to assist with breast cancer screenings, education and support, and to the national organization Kay Yow WBCA Cancer Fund. The late Kay Yow, the fund’s namesake, was a past president and founding member of the WBCA who was diagnosed with breast cancer in 1987 and passed away in 2009. The luncheon begins at 11:45 a.m. A limited number of luncheon tickets are still available for purchase by contacting Jenna Rangel in the College of Science at 574-631-3136. Tickets are $100 each or $150 per couple. Each ticket includes the luncheon, admission to the basketball game, a pregame chalk talk by an Irish assistant coach, and refreshments at Club Naimoli during the game. Originally published by Stephanie Healey at news.nd.edu on February 03, 2014.